WOW! This might as well be new construction since the owners have UPDATED ALMOST EVERYTHING: floors, carpet, fixtures, paint, and much more!! 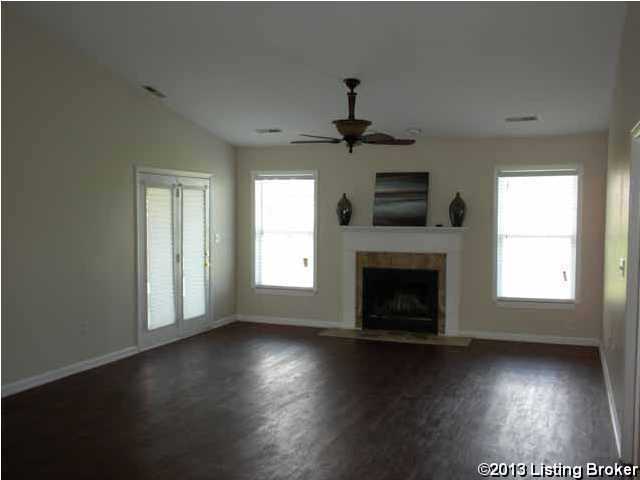 Beautiful 3 Bedroom, 2 Full Bathroom open floor plan with plenty of space. Eat-in kitchen plus room for a formal dining table or office area. Master Bedroom has HUGE bathroom with 2 Walk-in-closets, double sinks, jetted tub, and standing shower. Plus, there's a screened porch perfect for spring and summer entertaining and an attached 2 car garage. Small yard so there's less to take care of - BUT the lot backs up to a HUGE yard so there's a great scenic and peaceful view! Grandel Farms is a subdivision within the city of Louisville, Kentucky. There are currently 6 Homes for Sale within Grandel Farms, with asking prices ranging from $24,995 to $299,000. The average list price per square foot of the available inventory in Grandel Farms is $118, which is below the Louisville average of $157. The Average Sales price of all sold real estate in this subdivision for the past year is $215,775. Recent comparable homes have been selling for 97.48% of their asking price. Waterfront homes represent 66.67% of the available Grandel Farms inventory. The population of Louisville, according to the 2010 Census, is 597,337. The total number of households in the zip code of Grandel Farms is 10,405, with an average household size for of 2.54 people. The total number of renter households within the zip code of 40258 is 2,376, which means that 77.16% of households in this zipcode are owner occupant households. 5925 Grandel Meadow Ct, Louisville KY 40258 is a Home, with 3 bedrooms which is recently sold, it has 1,554 sqft, 0 sized lot, and 2 Car Garage,Attached,Driveway,Entry Front,Off-Street Parking parking. A comparable Home, has 3 bedrooms and 3.5 baths, it was built in and is located at 5915 Grandel Blvd Louisville KY 40258 and for sale by its owner at $ 266,000. This home is located in the city of Louisville , in zip code 40258, this Jefferson County Home, it is in the GRANDEL FARMS Subdivision, and Sylvania are nearby neighborhoods.